Controversy ensued recently after ESPN announced it was pulling out of a partnership with PBS over a special report on Frontline on concussions in football. ESPN was accused by many of being at the beck and call of its NFL overlords, who don’t take kindly to negative talk of any variety about their product. While ESPN vigorously denied these claims, the allegations were more believable because ESPN has a history of giving way to the NFL in the past, most notably when it stopped production of ESPN original series Playmakers. Playmakers is one of only two original series ESPN ever produced (the other is a poker series called Tilt, produced at the height of the poker boom, though that’s a story for another day). . Playmakers was the story of a professional football team, named the Cougars, from an unnamed city (my friend and I tried to make some educated guesses by eliminating the homes of the rival teams they played but we didn’t make a whole lot of headway) which plays in “The League,” similar too but not explicitly titled the NFL. The show revolves around the players of the team are the main characters are as follows: the hard-boiled coach, Coach George, put under all kinds of stress by an old, rich owner who expects to win, Leon Taylor, an aging running back who is seeking financial security while concerned about losing his playing time and his effectiveness, Demetrius Harris, a younger up-and-coming running back who is having a hard time separating himself from ill-meaning friends from his prior thug life, Derek McConnell, a cocky quarterback who pops anti-inflammatories like candy, and a Eric Olczyk, a middle linebacker dealing with depression and insecurity. Nearly every scandal and controversy that can befall an NFL team or befalls someone or other in the eleven episodes of Playmakers. There’s domestic abuse, a gay athlete (which the NFL still hasn’t gotten to deal with with yet itself, at least publicly), cheating on piss tests (a la Onterrio Smith, which hadn’t happened yet), abuse of anti-inflammatories, regular old drug abuse, weight issues, brutal constant injuries, involvement in shootings, difficulties staying away from potential bad influences from childhood , and so much more. Football is the star of the show; while it’s not so much about the games themselves (it’s got to be expensive and difficult to film football scenes), every outside aspect of the players’ lives displayed on the show is relevant in as much as it relates to their careers on the field. Romance and off-the-field drama is subjugated to the gridiron. During the season football is a 24/7 occupation and it dominates and permeates all of the players’ lives. 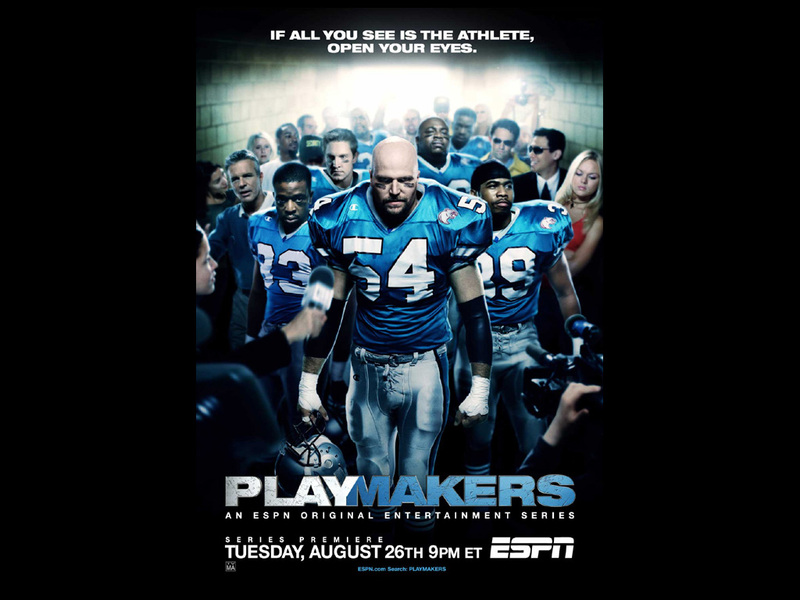 Playmakers is not a particularly great show or even a particularly good show but it is both an interesting artifact due to its place as one of only two ESPN original series, and for really being the only scripted show to ever focus on professional football. Considering pro football is such a popular topic, and has been the subject of many movies, it’s a little bit surprisingly that there’s never been another show about on football on this level. Friday Night Lights tread over some very similar ground, issues-wise, with high school football players with much better characters and writing, but if you like football, there’s definitely something worthwhile about an 11-episode show about pro football. The Wikipedia page for Playmakers is very strange. It’s missing some extremely basic data that would be quite helpful but it partially makes up for that loss with some incredibly fun and random information. Someone somehow has put together the entire roster for the Cougars, including the kicker, the punter, and three tight ends. It has no section for “reception” but has a remarkably complete list of what foreign channels the show was displayed on. There’s very little character biographical information, except the mention of what school the main characters graduated from, and what year this is for them in the league (Example: elder statesman running back Leon Taylor is in his 9th year from USC). Playmakers was fairly well-rated for ESPN but the NFL made its might felt and basically told ESPN to shut it down because it didn’t like the way football was being portrayed. Sensitive, much, really? Playmakers pretty much tread on stories that happened in real football, and it’s not like it was a big secret that these happen, or that people don’t know every scandal that engulfs the league. Nor that any Playmakers viewers, likely to be big NFL fans, would mistake reality for fiction. I’ve my problems with NFL over the years and this is certainly a good example of why. There are serious issues to solve (concussions, anyone?) and ESPN’s worried about a TV show hurting its brand, the most popular league in the richest country in the world. This cancellation could have lead to classic Streisand effect;. It clearly didn’t and most people who weren’t there don’t even remember that this show ever existed, but for one fall, before ESPN actually had football it was a minor deal. Wikipedia linked to a New York Times article describing the NFL’s putting the kibosh on Playmakers which contains the following hilariously un-prescient sentence, “”We proved that we could succeed in doing a dramatic series,” Mark Shapiro, the executive vice president of ESPN, said.” Hence the many successful dramatic series ESPN has produced since.